Members of the Ethiopian club joined with others from different cities and states to protest against actions of the Ethiopian government. For the last 15 years Meles Zenawi’s regime was ruling the Ethiopian people in brutality. Zenawi didn’t get his power by election or people’s willingness. He just came from the jungle and suppressed the Mengistu Hailemariam regime. Then he started to rule the Ethiopian people and country with only the rules he made, but the people didn’t accept or agree. Since Meles Zenawi got power, the Ethiopian people have been living a difficult life. 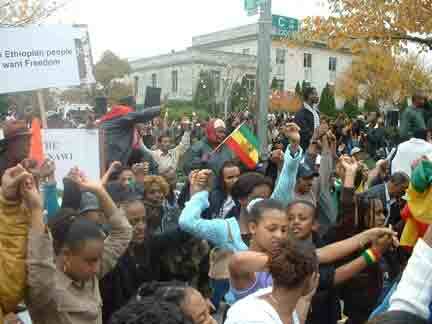 Ethiopian people tried to make changes in the country by demonstrations. But most of the time the response was beating, torching, firing from jobs, and being put in jail. The Ethiopian people couldn’t make a change for the last 15 years. But last year in May, people showed that they really need a revolution for Ethiopia. In an election that was held in May 2005, the opposition party Coalition for Unity and Democracy (CUD) won the election. But the Meles Zenawi regime cheated in the election and said that his party won the election. When the people heard the declaration from him through the mass media, many Ethiopians started protesting throughout the country. Soon after that Zenawi arrested thousands of people and continued torching and killing many people who were trying to protest. Later on he announced that if something happened to anyone who tried to protest against his party, he is not going to be responsible for that. So all parents should know this, because if there is an arrest or killing when there is protesting, then that is going to be a big risk for that person and family. While the people’s burden continues like this for those in Ethiopia, those who live in America, Europe, Canada, African countries and generally all over the world, became angry against Meles Zenawi’s regime. Specifically in the United States the Ethiopian community was trying to demand democracy and rights for Ethiopian people from Mr. Bush. 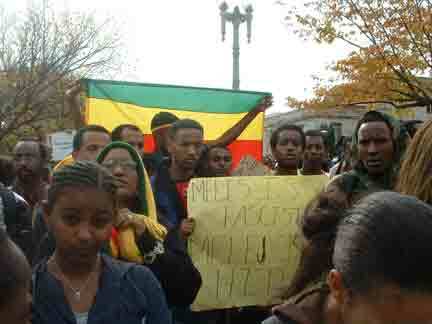 There have been several protests in the Washington, DC area that have been held by the Ethiopian community. The main purpose of the protest is to stop killings, to have democracy for people to respect the people’s rights, to release the political prisoners, and to stop arresting the people who are innocent in Ethiopia. The protests were often held at the State Department, the Capitol, and the White House. Also, the Ethiopian people asked the International Monetary Fund many times to stop donating money to the Ethiopian government. The International Monitory Fund first didn’t show any action, but in October there was a big protest where Ethiopians from every state and country participated. Ethiopian people never ever did this kind of protesting in the country and outside the country in Ethiopian history. We did it because all people recognized that this day is a crucial time for Ethiopia. Nobody wants to see Ethiopians in misery, famine, or disease anymore. And with this protest all Ethiopians in Montgomery Blair High School, Albert Einstein High School and High Point High School participated. “We can’t be silent while our brothers and sister or families are dying in Ethiopia,” we said. We are always safe, but people in Ethiopia are not. 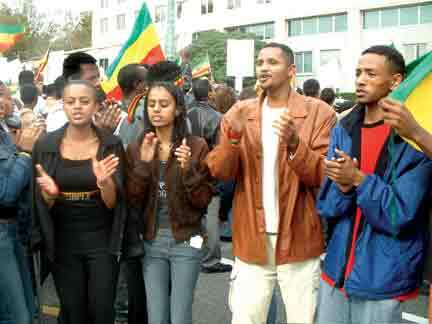 In the photos above, members of the Ethiopian Club joined with many from other cities in the U.S. to protest actions of leaders of their country.